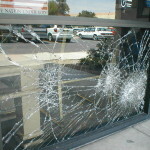 We repair all types of residential and commercial glass. Using only the highest quality glass and adhesives we will keep the elements out of your house as well as give you that piece of mind that a secure and safe new window will give you.We handle all insurance paperwork so you don’t have to. We are used to working with insurance companies, so you don’t have to. You will be quickly and completely satisfied with all work and ask about our lifetime guarantees.